Upon arrival at Goa Airport our representative meet and greet you and transfer you to the hotel. Rest of the day free for your own activity. Overnight stay at hotel. After breakfast proceed to Sahakari Spice Farm. Sahakari Spice Farm is situated amidst lush green surroundings at Curti. The taluka of Ponda in which it is located, is extremely popular amongst tourists for its rich cultural heritage and magnificently designed places of worship. 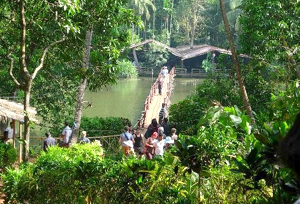 This Spice farm adds to the variety of tourist destinations that Ponda boast of. A place for relaxation under the dense forest cover, an aroma of a variety of genuine spices coming from the trees grown around the farm, lots of knowledge, guidance on the type of species and treatment for various diseases, sumptuous lunch in traditional Goan style, and other modes of entertainment, all this and more to add to a cherishable day at Sahakari Spice Farm. Sahakari Spice Farm occupying an enormous area of 130 acres, 60 acres of this area is exclusively devoted to the cultivation of Spices, Fruits, Medicinal trees and Herbs. 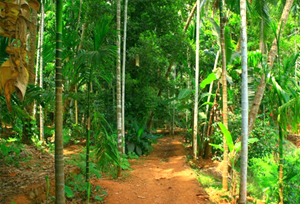 This Organic Spice Farm is reputed for the various types of Spices grown in a systematic and scientific manner. Some of these spices include: Cinnamon (Cinnamomum Zeylanicum), Nutmeg (Myristica Fragrans), Cardamom (Elettaria cardamomum), Pepper (Piper Nigrum), Cloves (Syzygium Aromaticum), Chilli (Capsicum frutescens), Curry leaves (Murraya Koenid), Turmeric (Curcuma Longa), Ginger (Zingiber Offcinale Roc). Evening back to the hotel. Overnight stay at hotel. After breakfast proceed to Abyss Spice Farm. This spice plantation is located on high mountains amidst stunning surroundings near Ponda. Many tourists visit the Abyss spice plantation as it is famous for the medicinal herbs that are grown over here on a large scale. On a typical excursion to the spice plantations, you shall begin your day by starting to explore the fields and the farms. It is very astonishing to see men climbing on very tall trees while maintaining a balance and at the same time plucking betel nut fruits from those swaying trees. The spice plantations are managed by people who have comprehensive knowledge and excel in technical know how of farming spices. 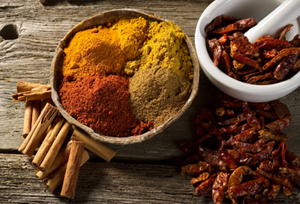 Some major spices produced in these spice plantations are: Black pepper, Cardamom, Nutmeg, Vanilla, Cinnamon, Cloves, Chillies, Coriander, Cashew, Betel nut palm. Evening back to the hotel. Overnight stay at hotel. After breakfast proceed to Savoi Spice Plantation. This plantation is now over 200 years old and covers an area of 100 acres. It is situated in the village of Savoi which is 25 kms from the capital city Panjim, 40 kms from Calangute in North Goa and 30 kms from the city of Margao in South Goa. This plantation boasts of a purely organic and natural environment, in which the guests can enjoy nature at its very best. The pond situated within attracts a number of birds of different varieties. Bird watching is one sport the guests can simultaneously enjoy as they explore the spicy world of Savoi Plantation. After reaching Savoi Spice Plantation you will have a guided walking tour by an expert along a shady path to explore the spicy world of Black Pepper, Cinnamon, Cardamom, Clove, Nutmeg, etc. in their natural environment. And also to enhance the tour are tropical fruits like mango, jackfruit, cashew, papaya, chikoo and medicinal herbs, shrubs and trees. Part of the tours also includes a demonstration of traditional beetle nut plucking where the person involved swings from tree to tree like your well know - Lord of the Jungle, ‘Tarzan’. Also included in this tour is observation of the traditional methods of making useful as well as decorative items made out of the coconut, besides other materials. Within 30 to 45 minutes guests will experience a brand new world of spicy and fruity environment. Some fruits and spices are of different varieties to get the unique chance of seeing it in its natural environment. Here are but a few of our fruits and spices which are within our plantation: Cloves, Nutmeg, Stone Star Spice, Mixed Spices, Jackfruit, Pineapple, Pammello, Bimbli. After breakfast transfer to the Airport for your onward destination.